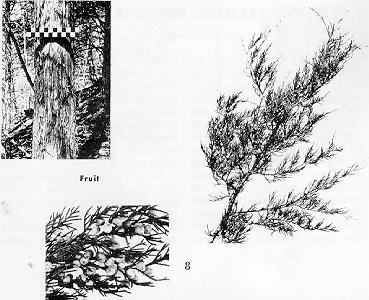 The redcedar is a small, hardy tree. It grows 40 to 50 feet tall. It is food for wildlife habitat and windbreaks. This tree has two types of leaves - one dark green, very small and scalelike, clasping the stem in four ranks so that the stem appears square. The other kind, often appearing on young growth or vigorous shoots, is awl-shaped, quite sharp pointed, spreading and whitened beneath. The twigs are four-sided. The berrylike fruits are about 1/4 inch in diameter and bluish to bluish white in color. The fleshy part is sweetish and resinous, enclosing one or two hard seeds. The bark is very distinct, being thin, reddish brown in color. It peels off in long, shreddy strips. Redcedar is one of our most durable woods. It is light in weight with an aromatic odor and a distinctly reddish to purplish red heartwood and cream-colored sapwood.